Sierra West Models make a very nice series of Backwoods logging cars in HO and HOn3, and are currently releasing versions in On30. The cars are outstanding in quality, but at nearly $80 even with the good exchange rate are quite expensive. I was most taken by the Pipe and Scrap car, which includes a scrap bin, shelving unit and workbench, finished with lots of bits and pieces all over it. I decided to try and scratch-build one myself. I based the car on the Boulder Valley Models 16 foot flatcar. I’ve made a lot of their stuff in the past and have always been happy with them. The flatcar is cast in white resin (almost all the BVM stuff is). Assembly of the flatcar was simple and by the instructions, taking only about 15 minutes – I used Kadee 0-80 screws for the couplers and 2-56 screws for the trucks. The trucks themselves are Tichy-Trains, with the JayBee 20″ wheel sets, both of which are available from BVM. Before continuing with the rest of the car I decided to paint the flatcar, figuring that it would be easier than trying later. I mostly use Citadel Miniatures acrylic paints, which are of a good quality and easier to get hold of these days than most paint, as they are stocked by Games Workshop stores. I started by painting the entire flatcar Chaos Black. I then used Bleached Bone to paint the individual boards on the car using varying amounts of paint to allow the black to show through so that the grain would stand out. With the flatcar ready, I started work on the shelves. I cut a piece of balsa sheet to scale 10′ by 6′ to form the back, and then cut 4 shelves (including the base) at 9’6″ lengths, using scale 12″ wide basswood. I then cut two 6′ lengths to be the vertical ends. I assembled the pieces onto the back, spacing the shelves around 1′ apart, leaving the top open. 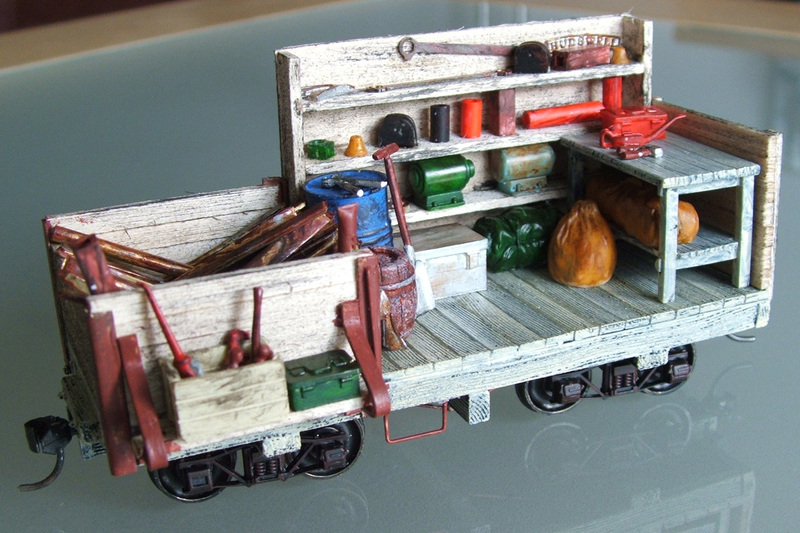 The workbench was a resin kit from Black Dog Mining, which I trimmed to make it fit, as it was too wide for the space. This was painted in the same manor as the flatcar. I added the shelves and workbench to the flatcar then began building the scrap bin, directly on to the deck. I cut four pieces of right angle brass, about 6″ in each direction, and 4′ long. Two were mounted directly to the corners of the flatcar, the other two I trimmed 1′ off one side so that it could be mounted to the side of the flatcar. I then cut lengths of 6″ basswood and built the four sides of the bin, between the four corner angles. The sides were made one board higher than the ends. I finally added a step and grab handle to the open side of the car to enable workers to climb aboard. The final part of main construction was the addition of a shelf to the outside of the scrap bin. This was done by bending two pieces of brass to match, formed to give a mounting point, base for the shelf underside, diagonal back to the car side, and a top mounting point. The finished bend appears as a 4 shape, without the right vertical part of the triangle. These were attached to the outside of the scrap bin, and then two lengths of 6″ basswood were added to form the shelf. With the main construction done, I stained the wood that I had added using the Citadel Black Ink, almost dry-brushing the wood to age it. I also painted the brass in Terracotta to indicate a rusty aging to it. This only left the adding the scrap, junk and other details to the flatcar. For this I used a number of resin casting from BVM and Black Dog Mining, tools from S & D Models, brass in different shapes and sizes, including I-beam, angle flat, tube, channel and rod shapes, tubes, rod and box section in plastic for general clutter, and a barrel and oil drum from Ten Commandments – basically anything I had suitable in my ‘bits box’ (I don’t actually have a bits box, but I do now wish I had – I kept finding things all over the place that I could use that I didn’t know I had). All of the pieces were painted, stained, dry-brushed, damaged and made to look used before being added pretty randomly to complete the car. Overall the scrap car has turned out pretty well, and I’ve quite enjoyed building it. Next up, I think I’ll have a crack at making my own version of the Sierra West blacksmith car, as kind of a companion piece.